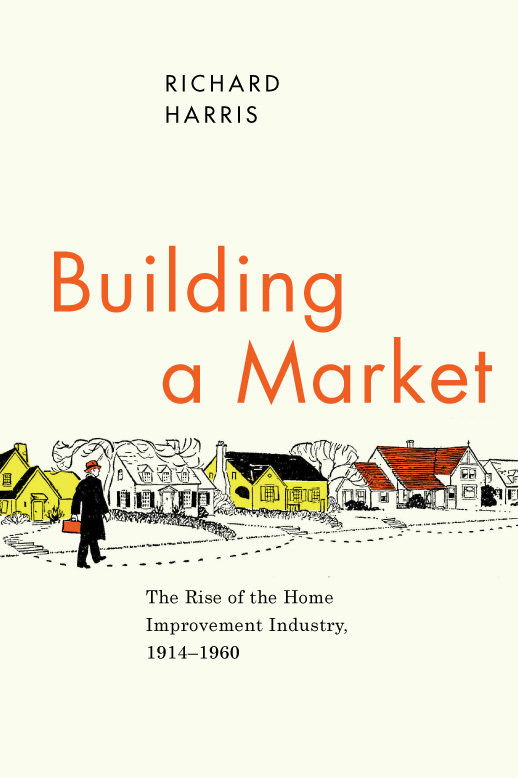 Building a Market: The Rise of the Home Improvement Industry, 1914-1960, Richard Harris, book cover, University of Chicago Press. This book documents and interprets the rise of the home improvement industry in the United States and Canada, 1914–60. It traces the interplay between homeowning consumers, the federal government, and an emergent home improvement industry that included retailers, lenders, and manufacturers of building materials. The narrative centers on retailers, primarily lumber dealers and then home improvement stores (1945–). Relying on trade journals, household interviews, company records, and federal archives, it shows how retailers responded to, and shaped, shifts in consumer demand, including the rise of Do-It-Yourself. These developments are set in the context of the initiatives of manufacturers of materials, and of governmental agencies, notably during the Depression. Interweaving technical, architectural, economic, and social arguments, it documents a significant but neglected aspect of the history of North American housing, and indeed of the social and economic history of the twentieth century. Educated at Cambridge University, Ohio State, and Queen's University in Kingston, Ontario, Richard Harris is professor of geography at McMaster University, Hamilton, Canada. He has received awards from the Council for Educational Exchange (Fulbright), the British Academy, and the John S. Guggenheim Foundation. He has received numerous research grants from the Social Sciences and Humanities Research Council of Canada. In 2010, he was elected a fellow of the Royal Society of Canada. He has published 89 papers in scholarly journals, five books, and numerous book chapters and reviews. Bridging urban geography, history, vernacular architecture, and economics, his research has concerned the twentieth-century history of suburbs, the building industry, and housing policy, primarily in the United States and Canada. He has written about housing in the British colonies, and is coordinating research, for an international project, on suburban land and housing markets in North America, South Africa, and India.